The Queen Elizabeth pulled in to Malaga dock, and we hopped off to explore the city. 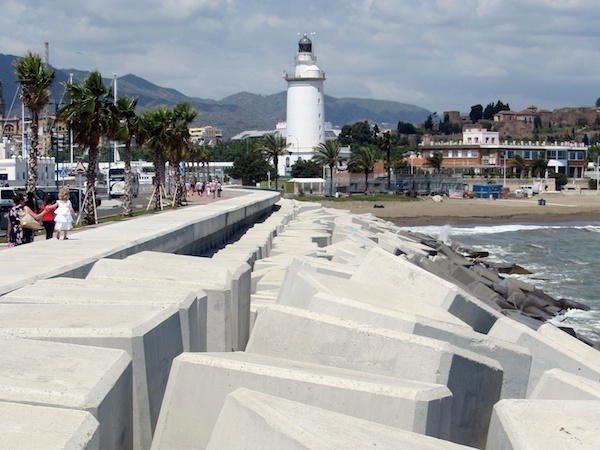 Most of the passengers jumped into the line of waiting taxis and buses, but we chose instead to stroll along the sea defences to the old lighthouse that marks the beginning of the town. Underneath the lighthouse, a cheerful man had lit a fire in an old rowing boat – a tradition along this coast – and was cooking fish for sale in the neighbouring cafe. I had vague childhood memories of tower blocks and traffic, so I was prepared to be unimpressed, but in fact we both instantly felt at home in this happy, vibrant town. 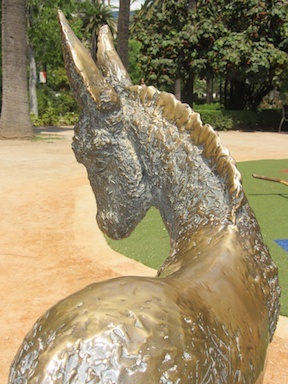 The visitor from the sea instantly finds himself in the exotic gardens of Malaga Park. This was built at the end of the nineteenth century when it was realised that most of the citizens of the city could not afford to visit the wonderful Botanical Gardens that are situated to the north of the town. To this end, the local ship owner instructed his captains to bring back trees from whatever part of the world they found themselves in, as they shipped their cargoes across the seas. The result is a lovely strip of very exotic trees, scattered with mosaics, fountains and sculptures. The most obvious building in town is the cathedral, known locally as ‘The Cripple’ because it was never finished and is missing a tower. Built over such a long period that each facade is from a different architectural era, the interior of the cathedral is awe-inspiring. 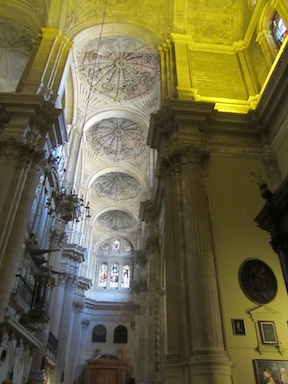 There are dozens of altars and chapels, and an incredible ceiling that just makes you want to lie on the ground and stare. We didn’t really have time to visit the Alcazabar (castle) on this occasion, but we did nose around in the Roman amphitheatre below it, and the recent archaeological discovery of enormous stone vats that were used for brewing a famous fish sauce, the recipe for which has since been lost to antiquity. With only a day to spend in Malaga, we finished our trip by visiting the striking group of buildings known as the ‘ABC’, for ‘Ayuntamiento, Banco, Correos‘ (Town Hall, Bank, Post Office). Then, as was normal for this whistle-stop voyage, it was back to the ship for dinner. This entry was posted in Europe, Spain, Travel and tagged Cunard on 2013/04/23 by Reinhard.